The market looks evenly split between VMware and Citrix. Joe in the comments below mentioned a 60%-30% split in favor of Citrix. I added this for completeness. Note the clear preference that customers have for VMware for their VDI back-end. I will share more third party data as I run into it. Interesting data Vittorio, thanks for sharing. I’m very surprised to see Microsoft doing so well. It would be interesting to see the detail behind the data and understand what Morgan Stanley considered to be Desktop virtualization for the purposes of this survey. A broad definition including App-V and Windows XP mode in Windows 7 might be responsible for raising MS score here. yes, that is an interesting one. 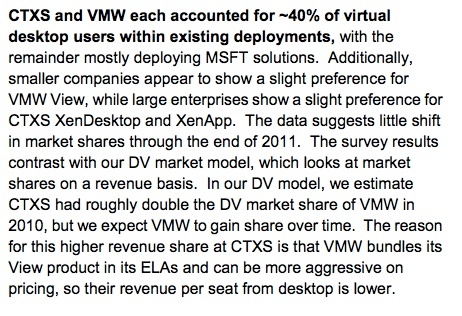 Interesting – the Morgan Stanley Report itself quotes 60% market share to Citrix and 30% to View? And, I can’t see that graph in there? Something is up? Thank Joe. Where exactly? The study mentioned a MODEL for revenue that they made (not installed base). I am adding it to the article for completeness. I am more interested in what people use in production. I haven`t seen the 2011 data but in the March 2010 Morgan Stanley CIO data it was clear that VMware was leading this race. I am looking at a slide right now from that survey that states 49% share to VMware, 18% to Microsoft and 17% to Citrix. Word on the street though is that it is very much a 2-horse race between VMware and Citrix, so I wonder how good these surveys are and how wide their response pool was. Numbers schmumbers I guess. Great summary, Vittorio. There are lots of numbers out there and, assuming we believe this Morgan Stanley report, you did a good job of clarifying them. Hi, Can you please confirm you are referencing the Morgan Stanley Report dated March 30, 2011? I don’t think you are. Thanks for clarifying. That report you reference is based on customer surveys – not what’s shipping. That makes more sense as the numbers are 60-30 in favour of Citrix.